It’s that time of year. 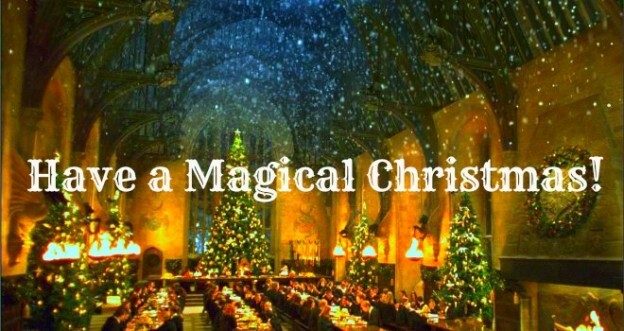 Black Friday is next week, and Christmas is just around the corner. 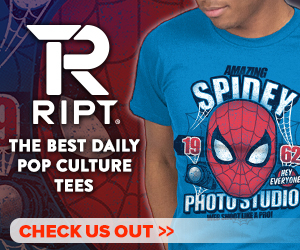 Not sure what to get that special geek in your life? 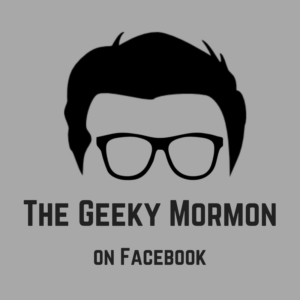 Have no fear, your friendly, neighborhood, Geeky Mormon is here to help. Each day over the next week I will be releasing a list of 10 gifts to help you out. Each day will be a different fandom, starting today with Doctor Who. If you see something you like, just click on the picture and it will take you directly to a site where you can buy it. 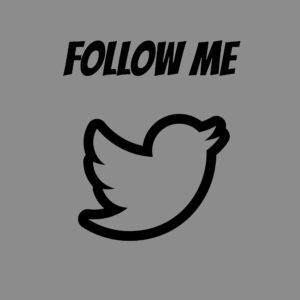 As a disclaimer, I am not sponsored or affiliated with any of the sites listed and I am getting nothing in return for this, just here to help you out. 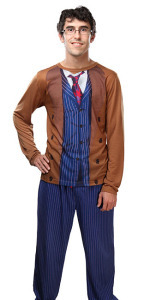 So much Matt Smith goodness, definitely a great buy for any Whovian. 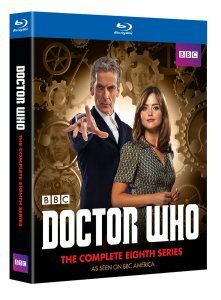 This is the dream collection for any fan of the 11th Doctor, especially those that are still struggling to adjust to the new Doctor. The suggested retail price is $150, but you can find it now at Overstock.com for $101.73. This may be a small package, but with the hours of entertainment, and all the adventures, this set is definitely bigger on the inside. 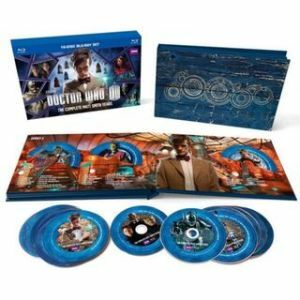 Relive each cooky, heartfelt moment of the 11th Doctor from “The Girl Who Waited,” to “The Time of the Doctor.” I would live to find this under my tree. So much Eyebrows. Just eyebrows. Whether they want it on Blu ray, DVD or streaming video, the holidays are the perfect time to sure this gift with a loved one. Get to know the newest Doctor, and relive each of his adventures as you prepare for the Christmas special. Who’s up for a Doctor Who Christmas day marathon? Who wouldn’t be up for it. On Amazon right now the Blu ray is going for $64.96, DVD is $54.96 or Amazon streaming video for $29.99. Your choice, but whatever format you choose, it will make your Whovian’s Christmas. For those times when it’s bed time, and you just don’t want to go. Do you find that the cookies always seem to go missing from your cookie jar? I know with our 5 little monsters we have zero luck keeping any sweets or cookies in the house. The minute our backs are turned, they have their hands in the cookie jar sneaking away the cookies. Not only is this jar stylish, but it eliminates that from happening. The electronic part is the T.A.R.D.I.S. sound effect each time the jar is opened. 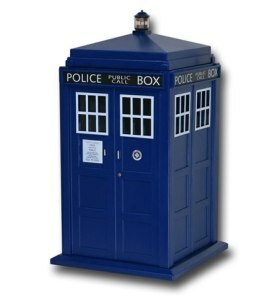 Plus, it is bigger on the inside, so you could keep dozens and dozens of cookies in there. (Note: The jar is not actually bigger on the inside) The jar can be yours for $49.99 at SuperHeroStuff.com. Because sometimes, the family togetherness gets to be too much. Ahhh- Monopoly, the game that has breaking friends and families apart for decades. 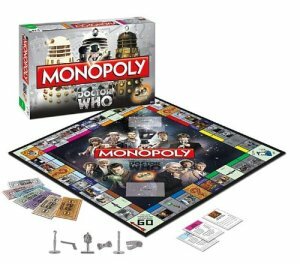 Now you can play it with a Doctor Who twist. 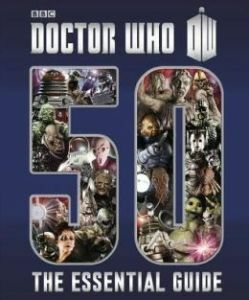 This is the 50th Anniversary edition, so it has elements that will make the classic Who fans and the new Who fans happy. This is a great gift to open and then use to while away the hours until the special is on. It is available right now on Amazon for $36.66. Stylish. Warm. Loyal. Smarter than you. Need something to go with your new Christmas jammies to keep your feet warm? 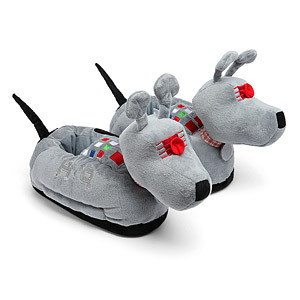 What could be better than your very own pair of K-9 slippers? Nothing, that’s what. I love this little robot dog, and wish he was still around. These slippers are an exclusive to the ThinkGeek site, and retail for $29.99. 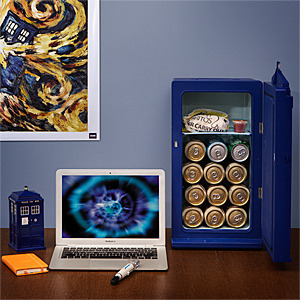 I know it looks small, but I can fit a couple 12 packs of soda in here, ’cause it’s bigger on the inside. Who doesn’t have stuff they want to keep cold? Everybody has stuff they need to keep cold. And now, with this awesome mini-fridge, you can keep that stuff closer to you than before. Have an office downstairs, but the fridge is upstairs? This will solve that problem. Now the sodas will be kept cold right in your office. Awesome. $149.99 at ThinkGeek.com. Who wouldn’t look good in this? This might be number one on my gift wish list this year. I like the color, I like the look, and I love hoodies. The hoody is available in sizes Small to XXXL on Amazon.com. 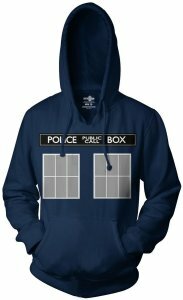 Hoodies like this are going to be hot commodities this year in Salt Lake, since FanX is taking place in January. It’s going to be cold, and you will need to bundle up, and with this you can bundle up and look awesome. For the person who doesn’t know it all, but would like to. Great book, and now only $12. Celebrate 50 years of the Doctor. Great coffee table book, and what fan wouldn’t want this. Get to know the Doctor even better. Maybe you only know the new stuff, now you can get to know all 11 Doctors (11 at the time of the 50th). Nice hardcover book. Worth checking out. Your very own sonic that actually sonics something. Tired of losing all of the remotes? The basic, boring, universal remotes don’t really do it for you? Then check out this beauty. Impress your friends as you wave your sonic to activate your television viewing device, or wave it again to control the volume or start a movie. It’ll control all of your devices, and you’ll look great doing it. This is available at Amazon.com for $100. There you have it. 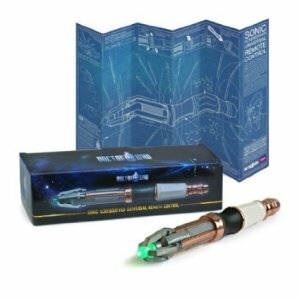 10 great gift ideas for the Whovians in your life. Come back tomorrow as we cover 10 gift ideas from the realm of Middle Earth. This entry was posted in The Doctor 101- Doctor Who and tagged Christmas Gifts, Doctor Who on November 21, 2014 by Jake Dietz.